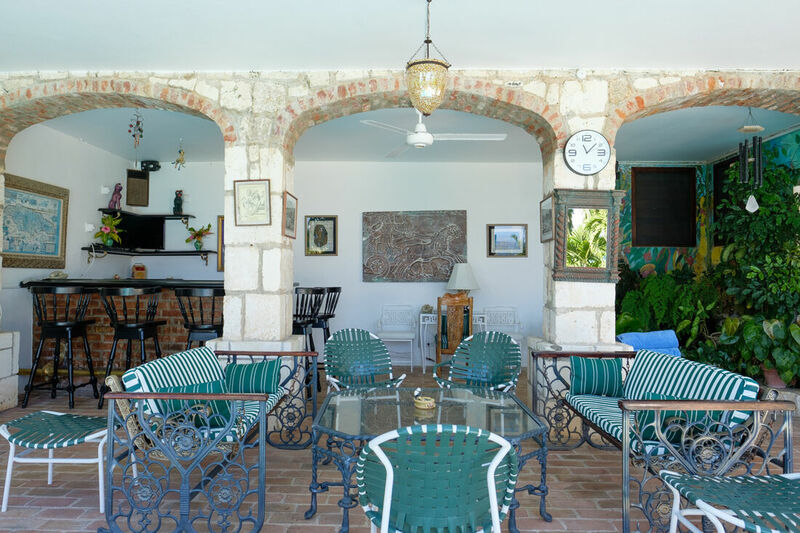 SUMMER SPECIAL FOR 2019: Tryall Club is improving their beach and restaurant this summer! 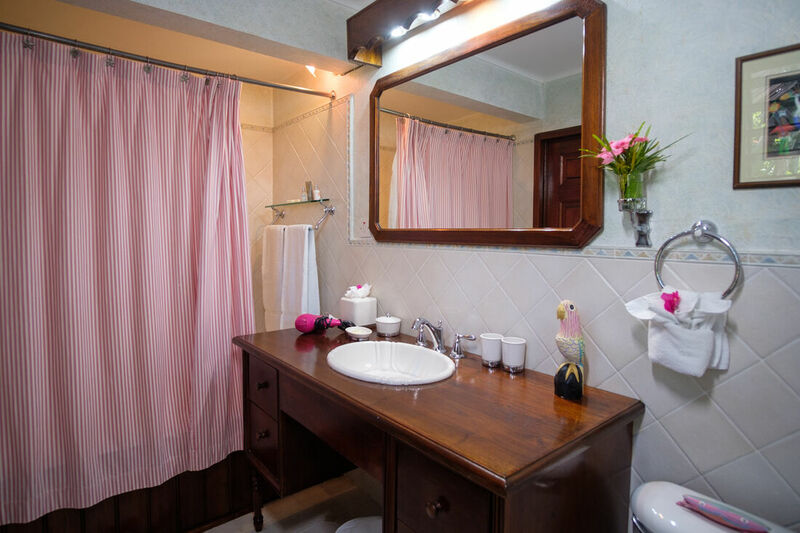 We are happy with the improvements! 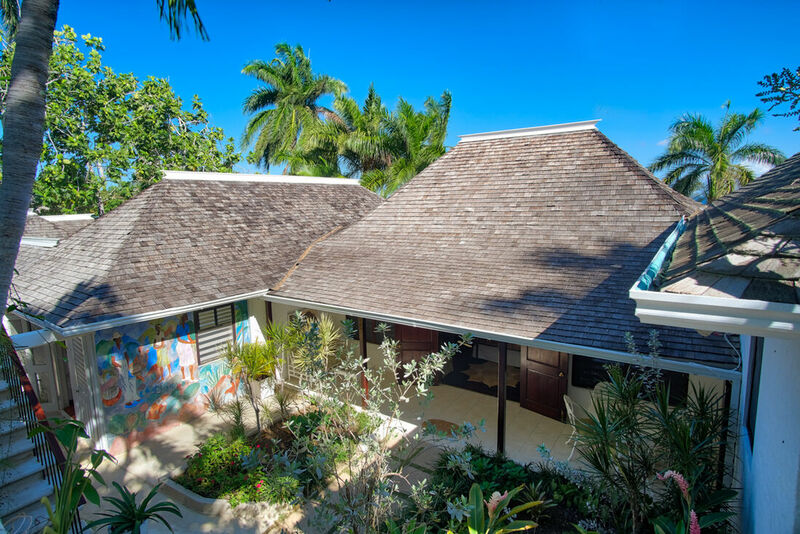 So we are having a "beach contruction" sale!! 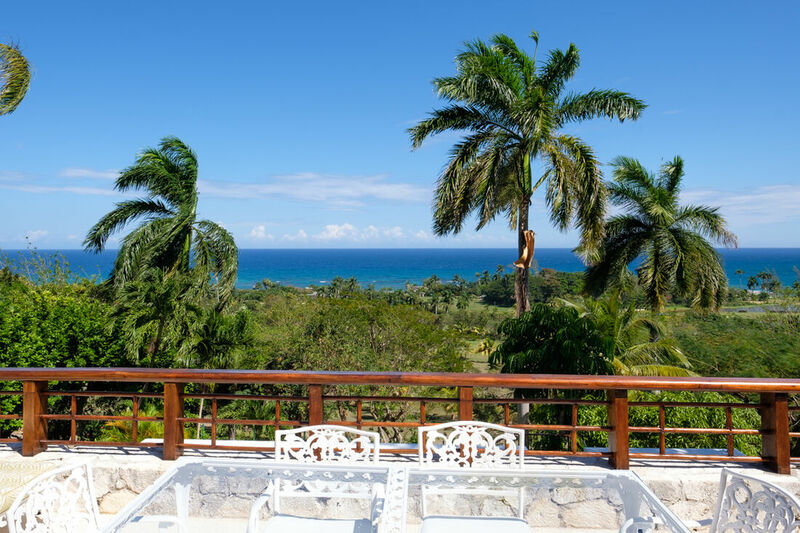 You will have beach access at another beach called "Pretty Beach" Our sale is from May 1 to November 1, 2019 travel dates. 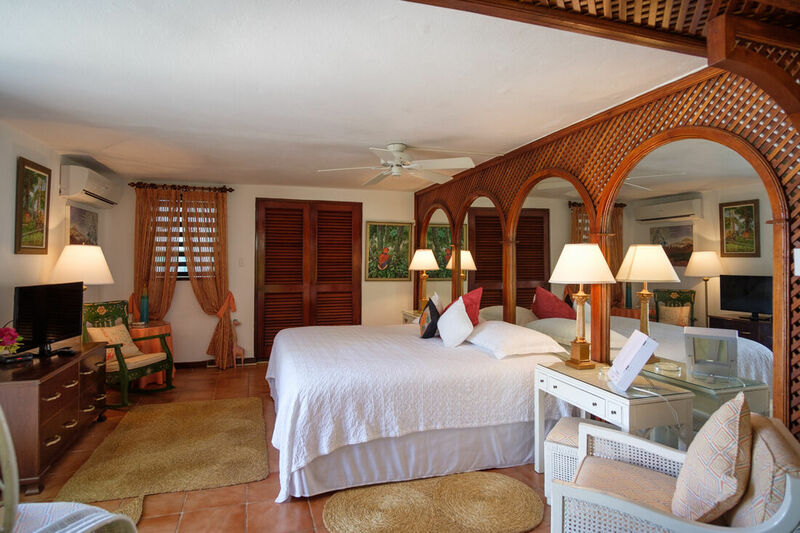 ONE FREE NIGHT WHEN BOOKING 7 NIGHTS - PAY FOR 6 NIGHTS, STAY FOR 7 NIGHTS! 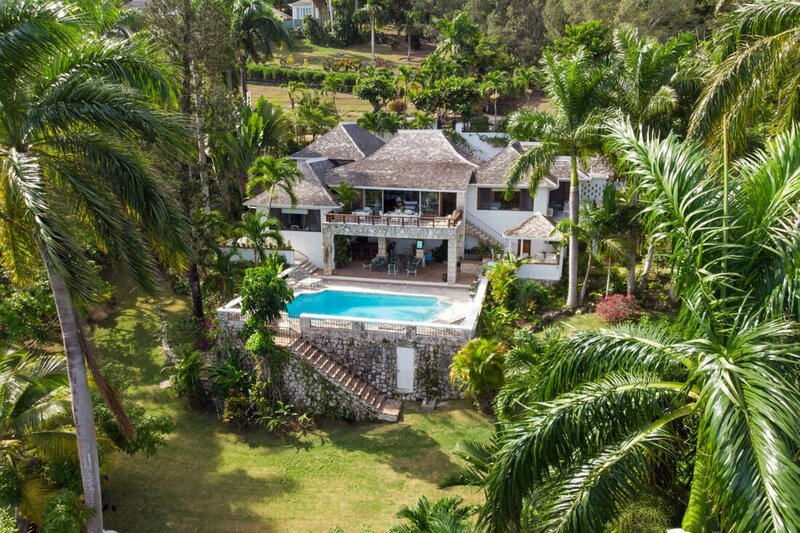 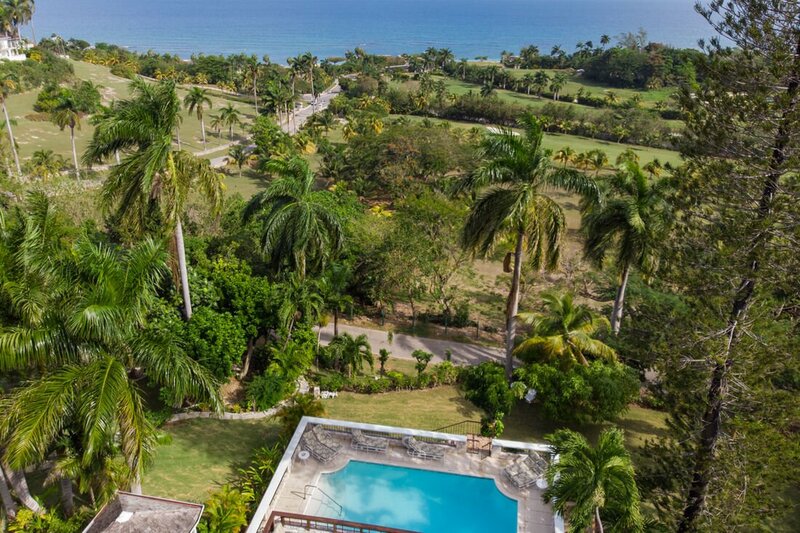 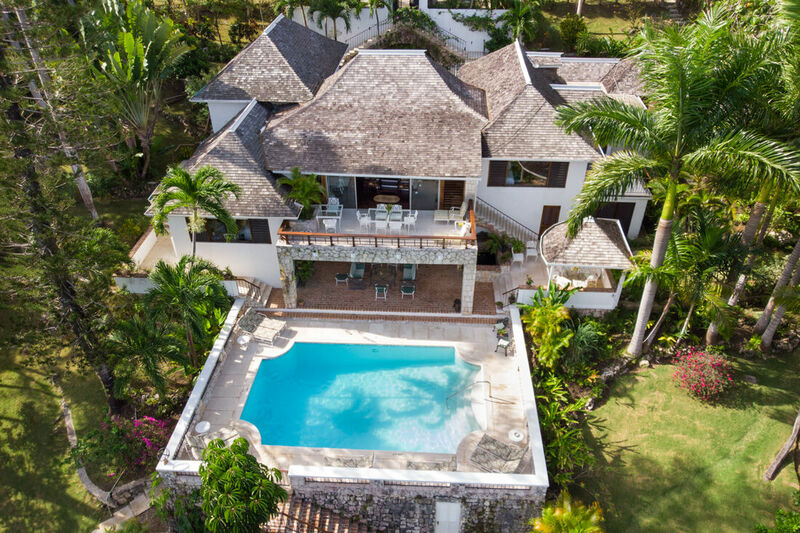 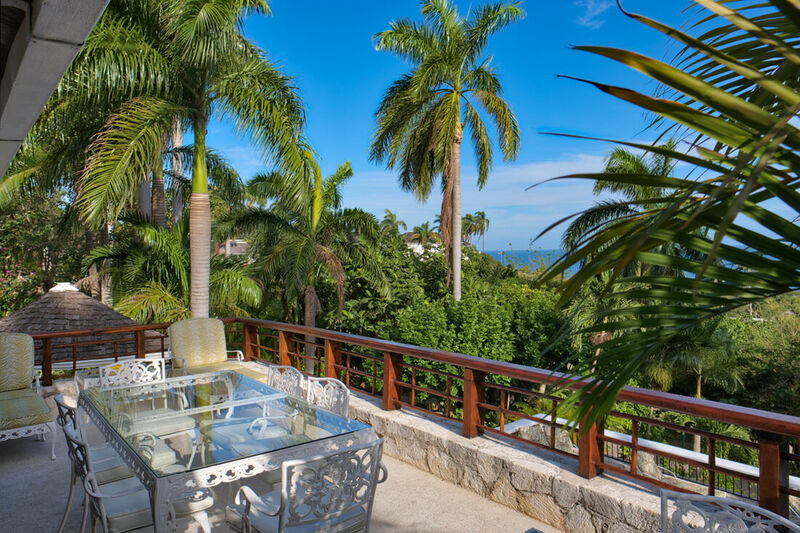 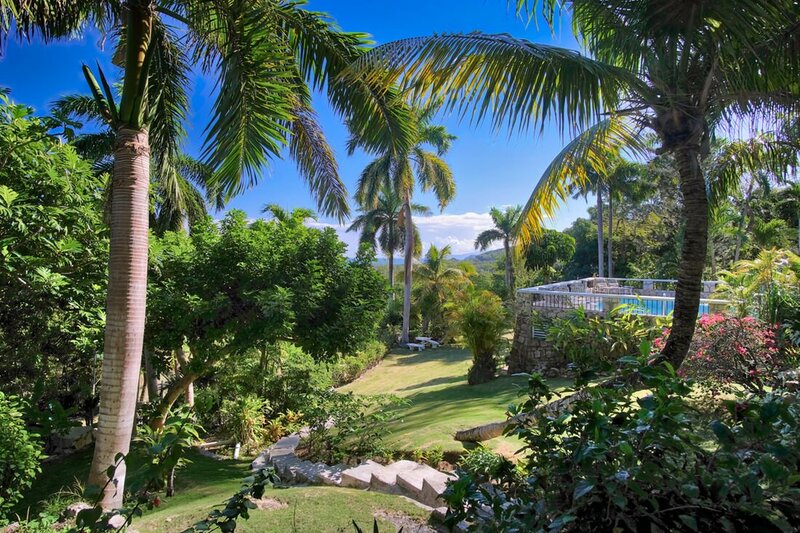 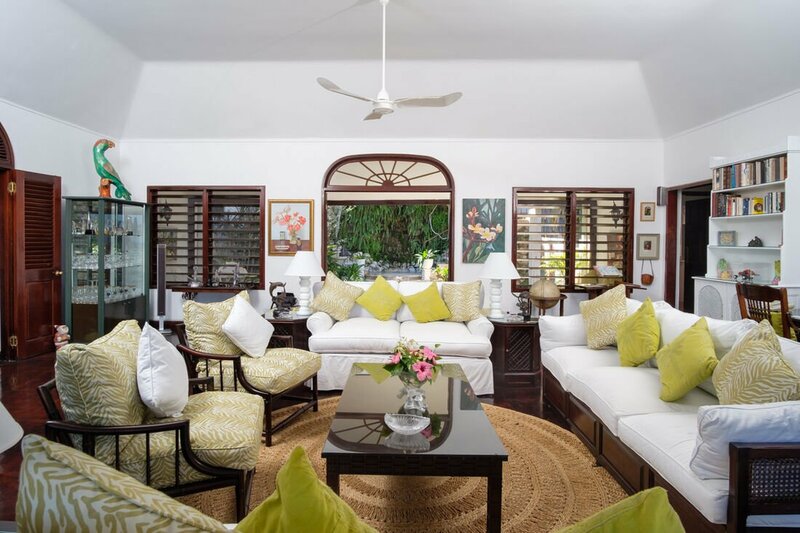 4 bedrooms, 4 bathroom villa overlooking golf course and Caribbean Sea views! 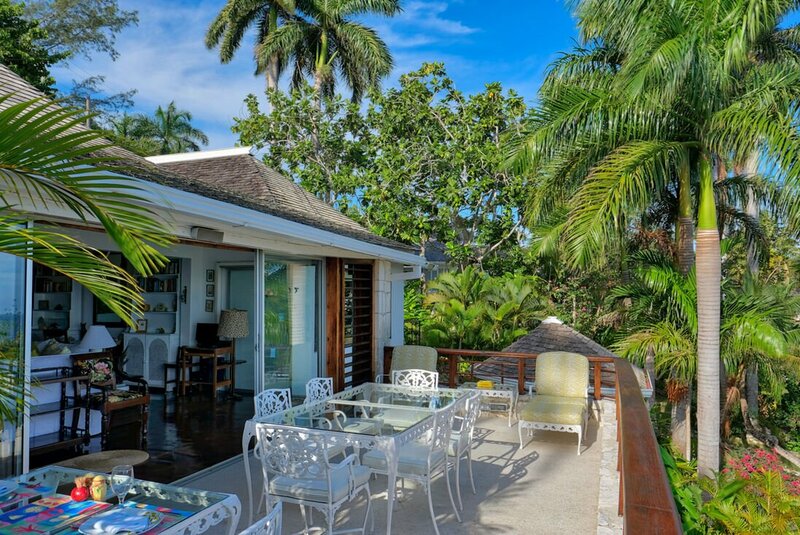 2 minutes to the beach by golf cart! 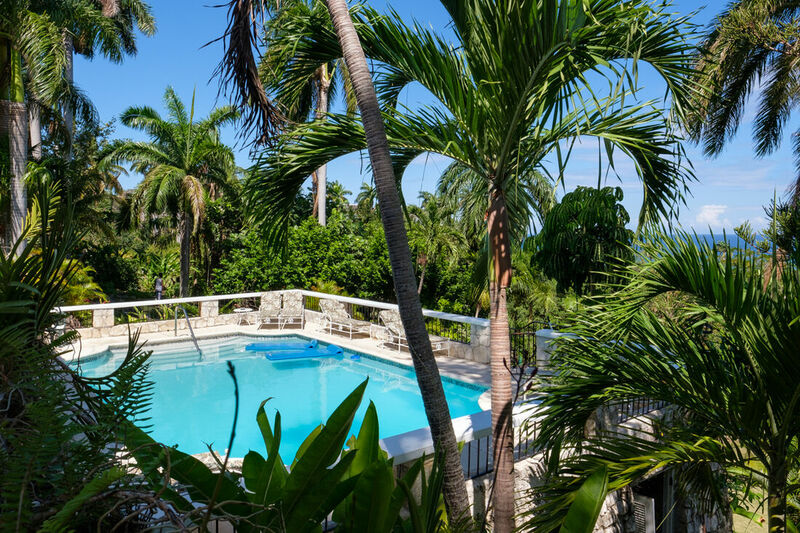 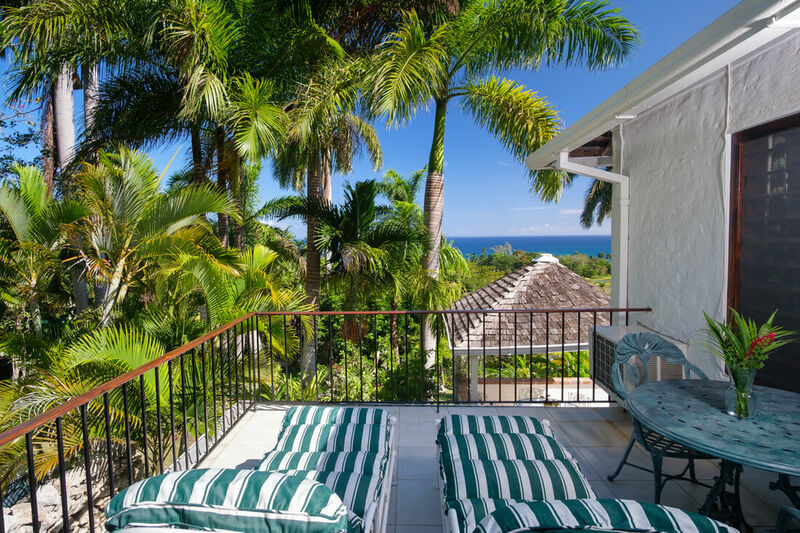 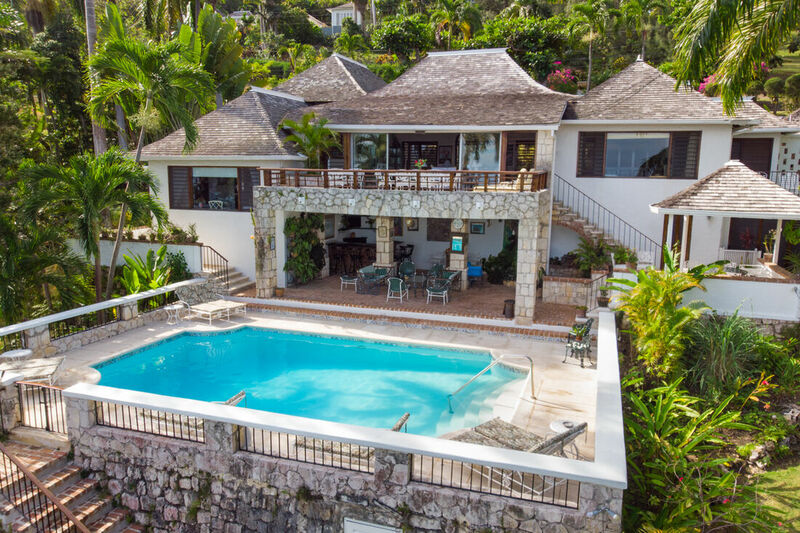 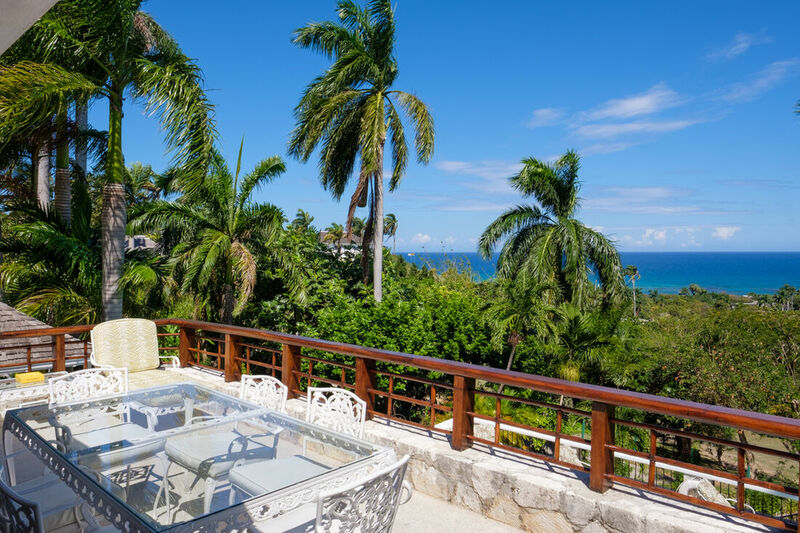 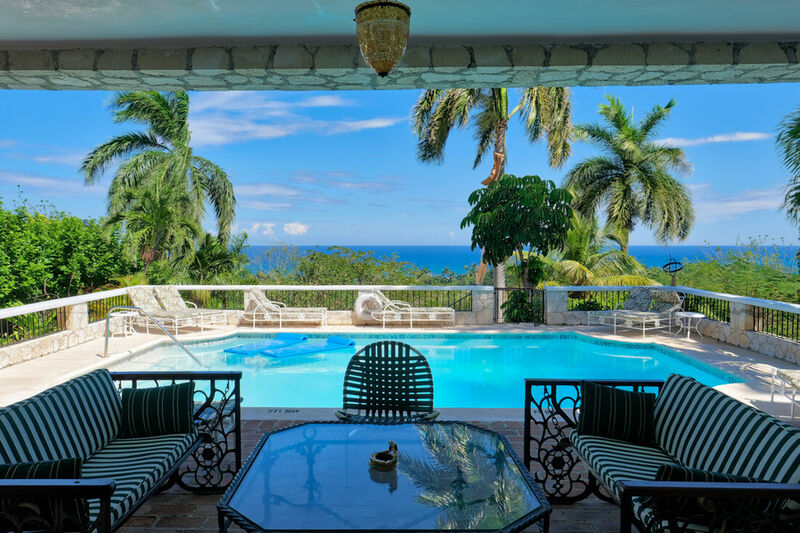 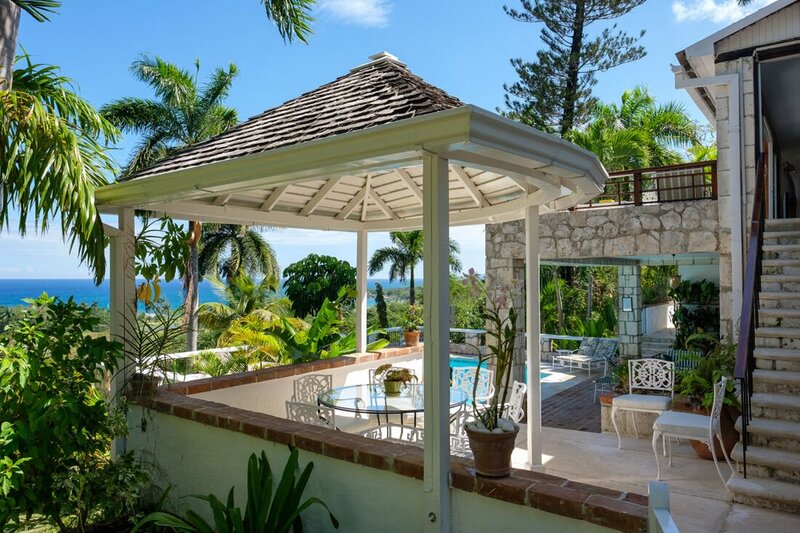 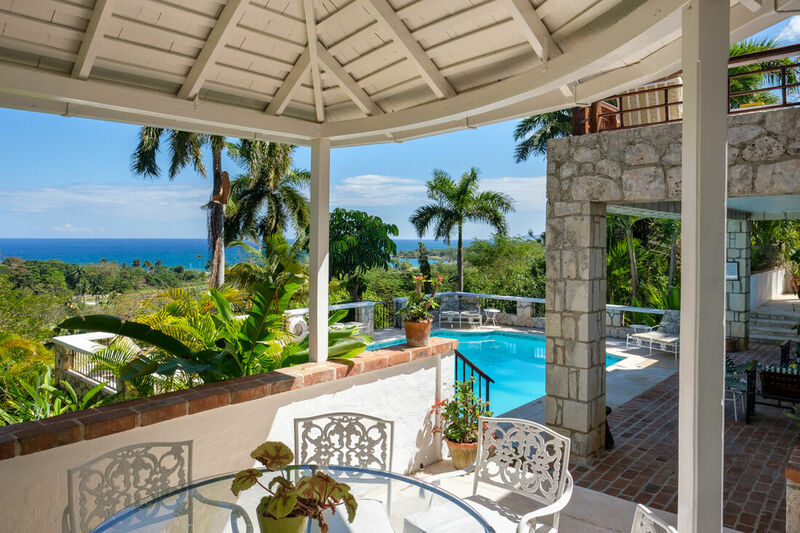 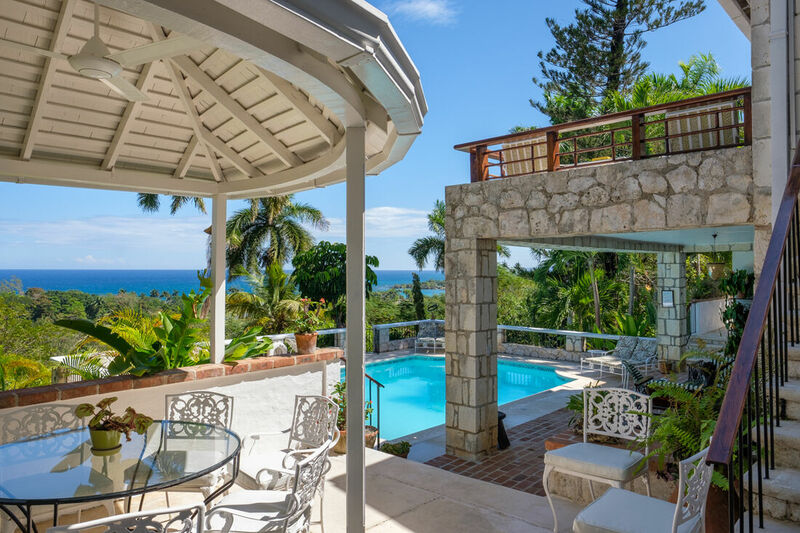 Fairwinds is a lovely four-bedroom private villa with a fantastic view of the glittering Caribbean Sea and the renowned Tryall Club golf course. 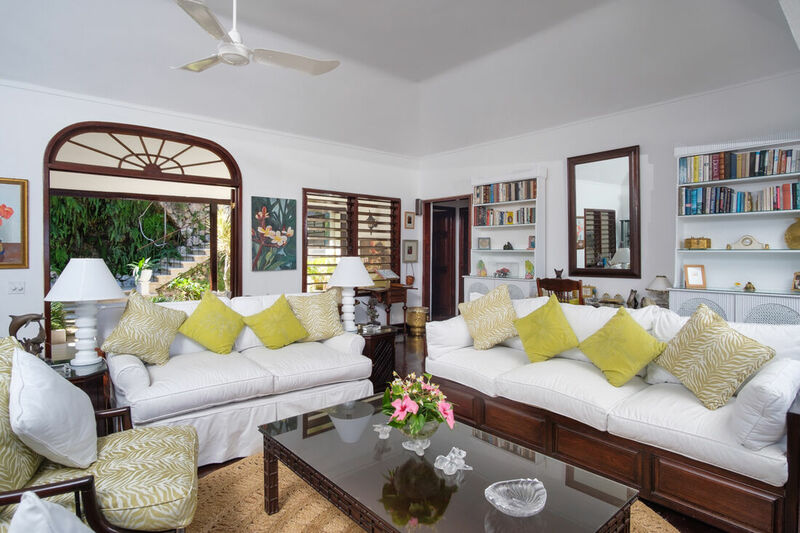 The interior has been designed meticulously to create a fantastic home away from home. 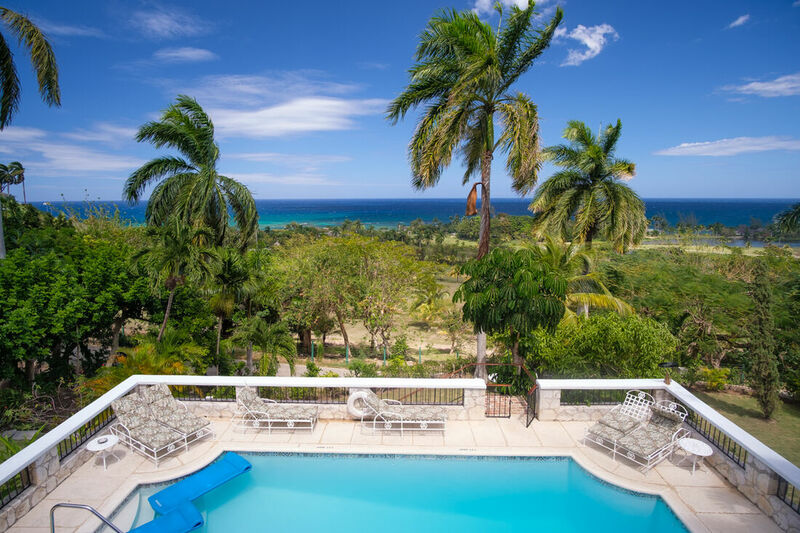 Mahogany parquet floors, sunken Roman baths, cable television, surround sound and a professional chef make Fairwinds one of the best luxury villas Jamaica. 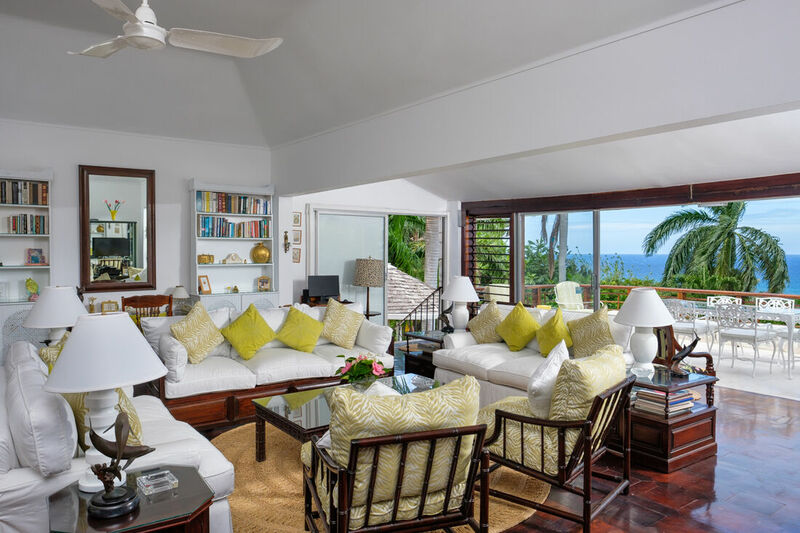 Fairwinds has a spacious living room that exudes comfort and style. 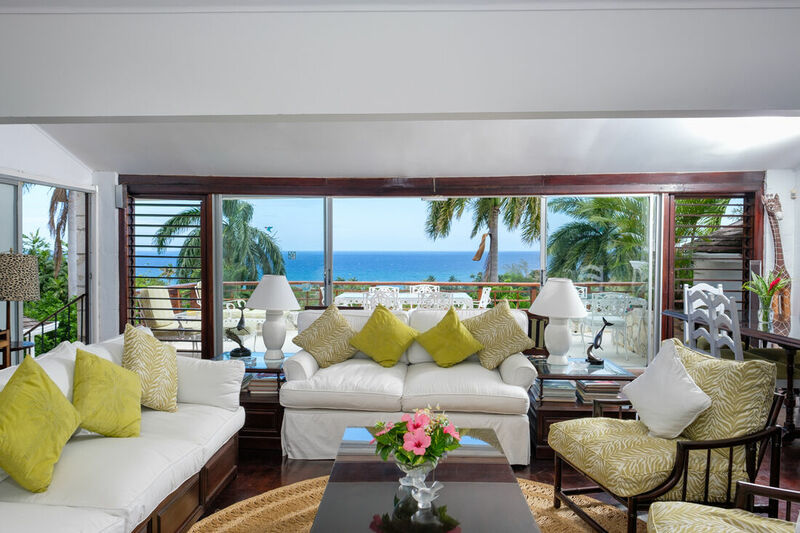 Glass panels open to a spacious balcony that showcases picturesque views of the beautifully maintained golf course and the ocean blues. 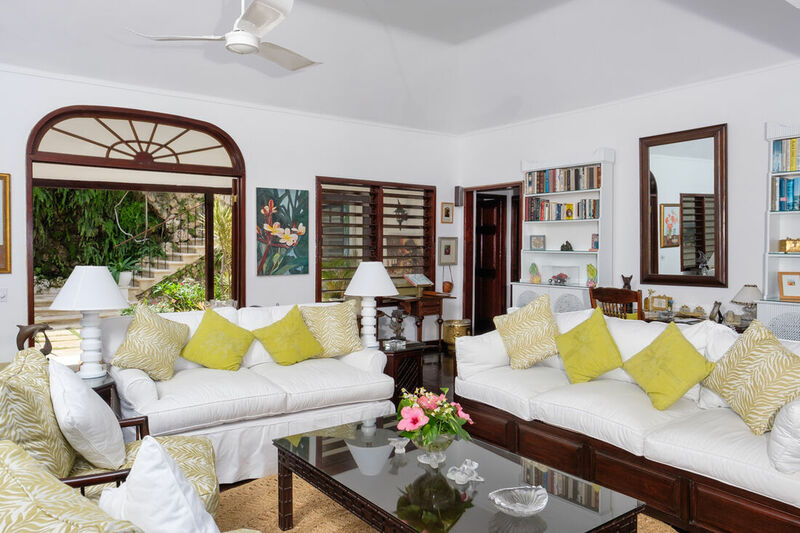 Cable television, sound system, DVD player, a CD and DVD library for adults and children, old-fashioned games and a well-stocked library of excellent books make the living room quite entertaining. 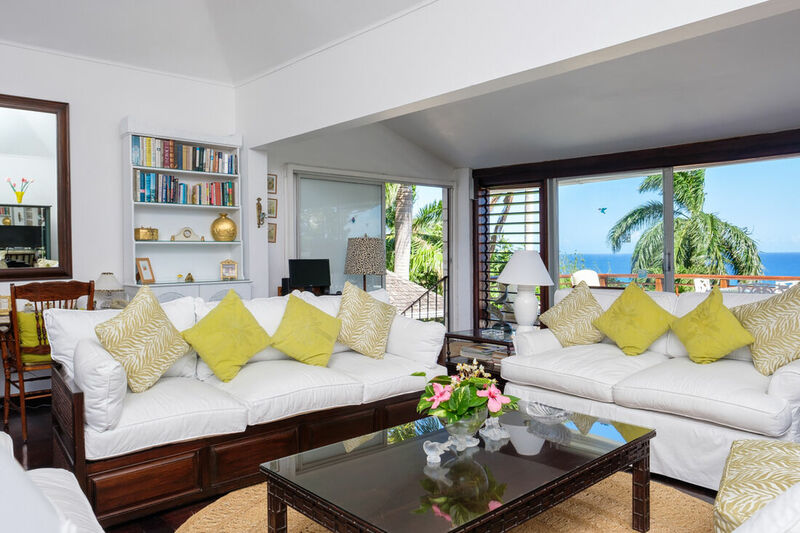 Additionally, the living room is furnished with a computer and ADSL wireless Internet. 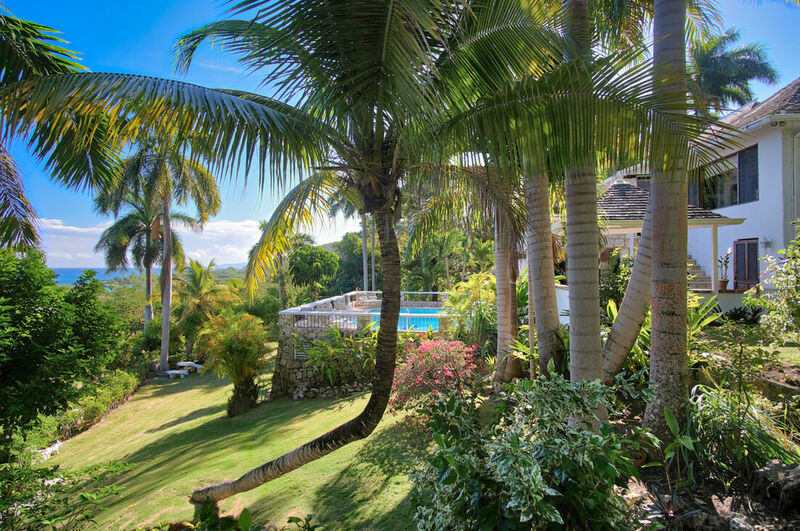 The expansive pool surrounded by exotic orchids and the poolside bar create a lovely picture. 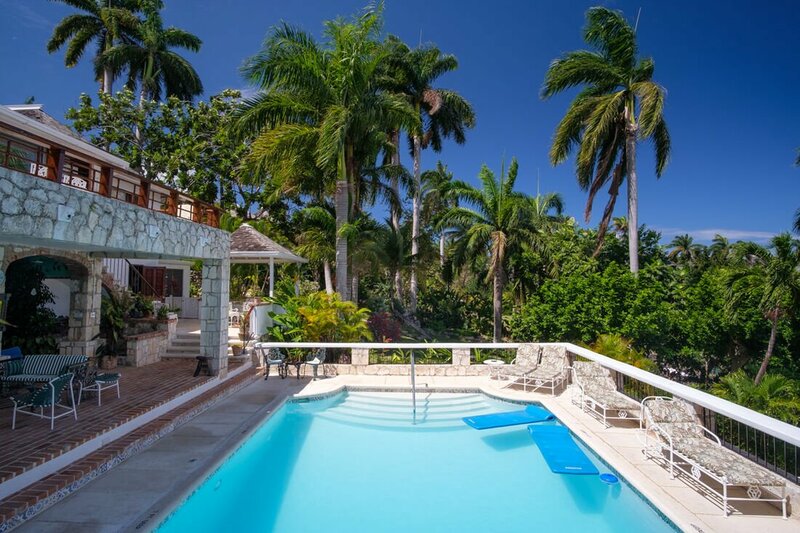 The swimming pool is one of the favorite spots for most guests, who can enjoy drinks at the covered poolside bar after an invigorating swim. 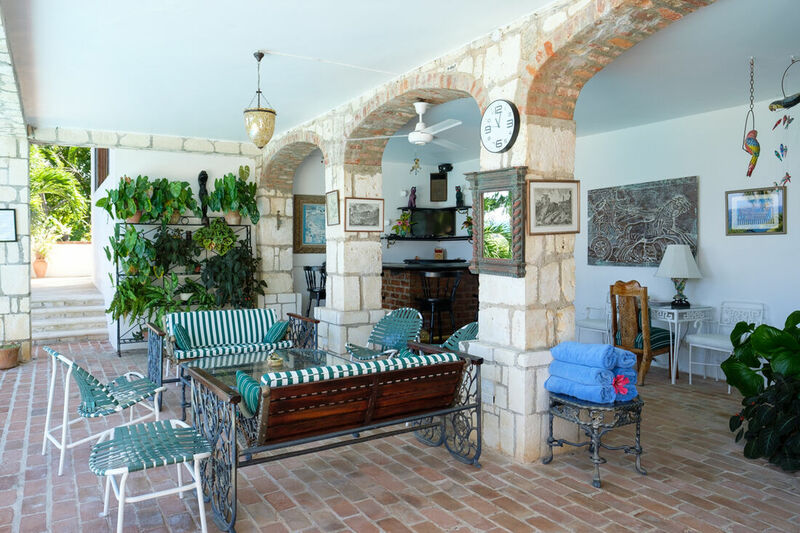 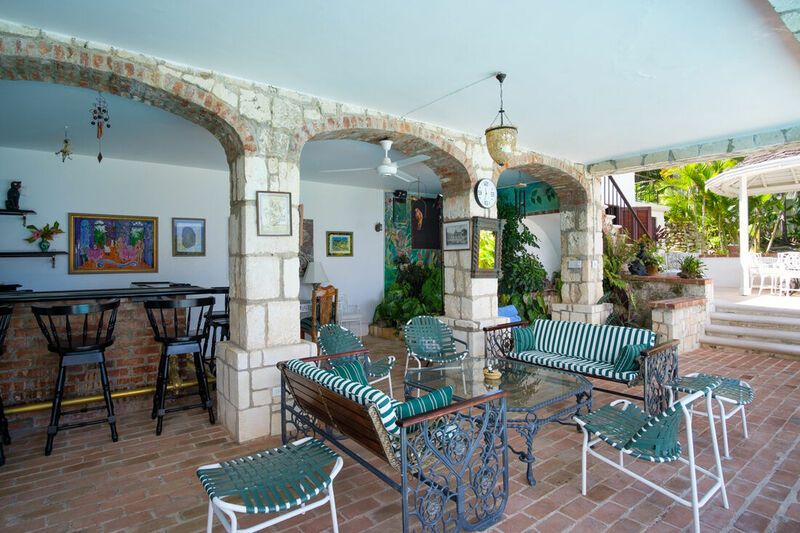 The pool is adjacent to the verandah which is equipped with cable television, telephone, stereo system and ice maker, all placed below the dramatic stone arches. 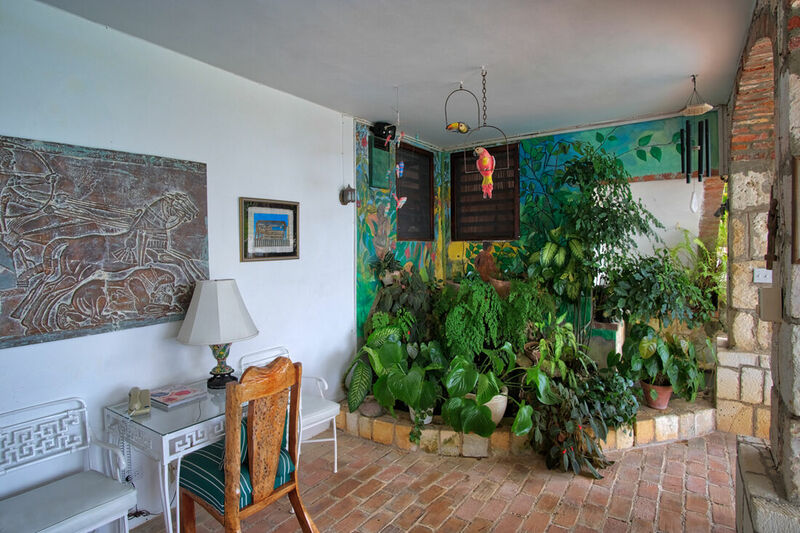 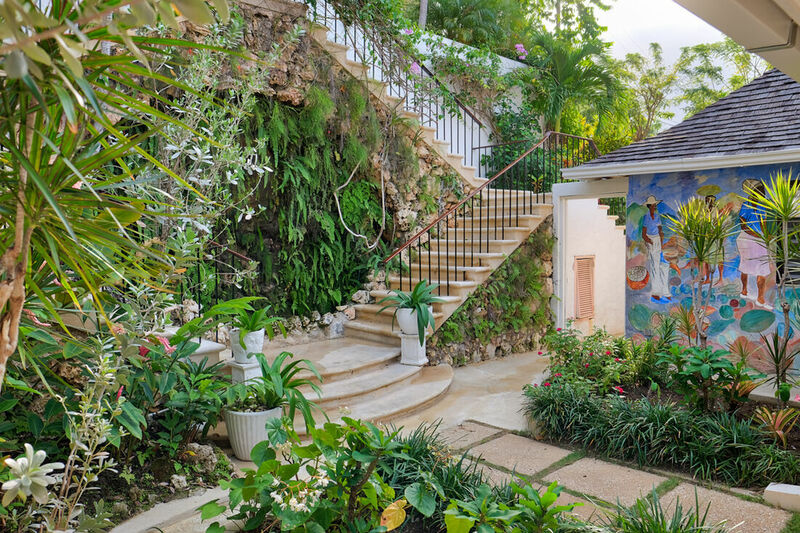 The fish-filled grotto is a unique feature of this Jamaica villa and is very popular among children, who love feeding the fish. 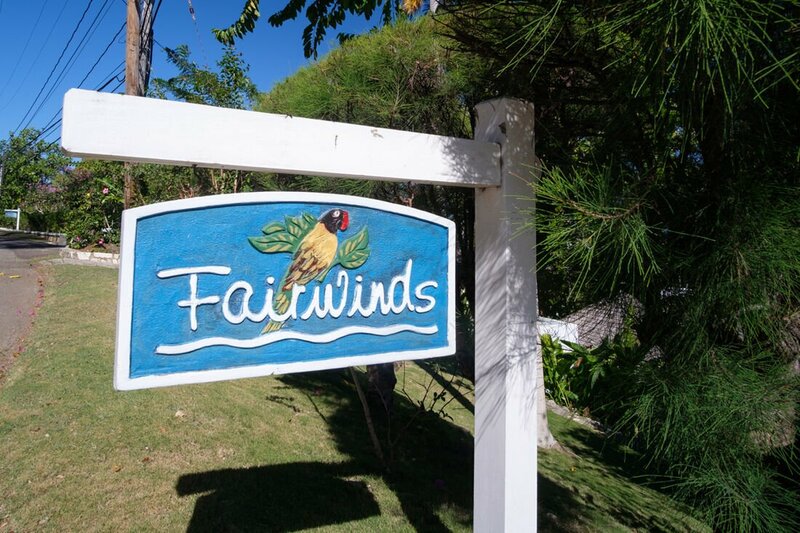 All the bedrooms at Fairwinds have ceiling fans and air-conditioning. 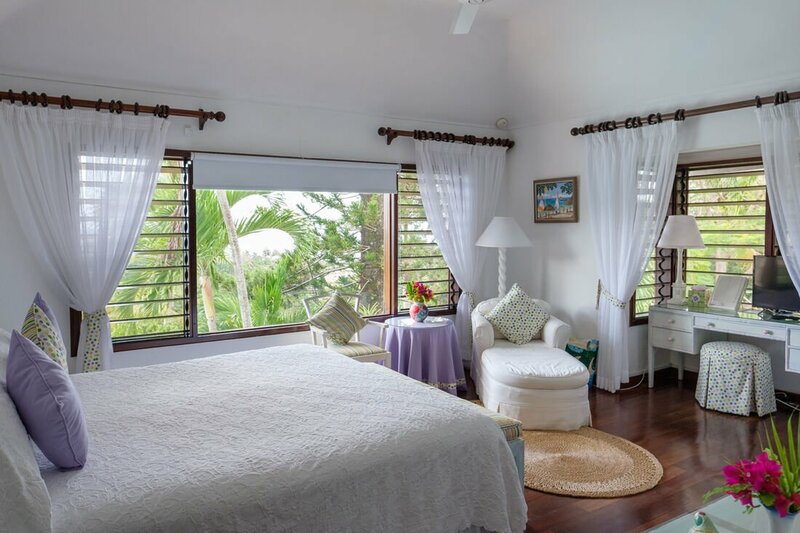 The romantic, glamorous and private master bedroom is located on the ground floor, very close to the pool and bar. 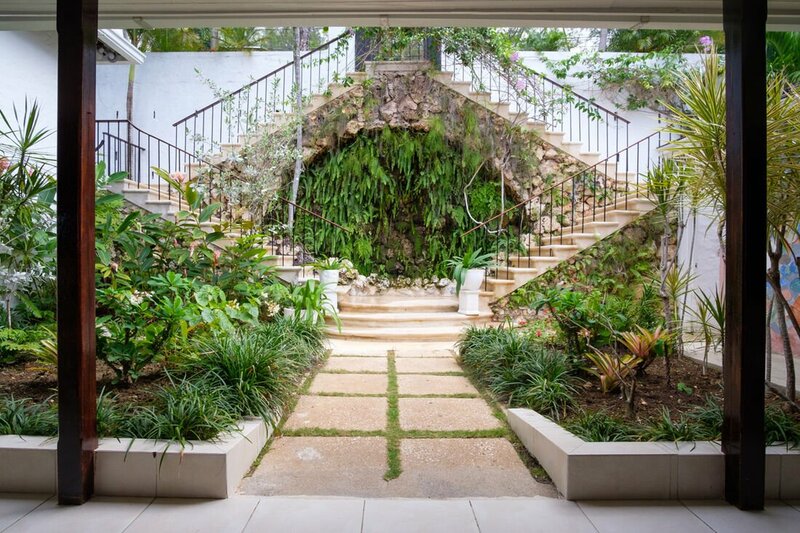 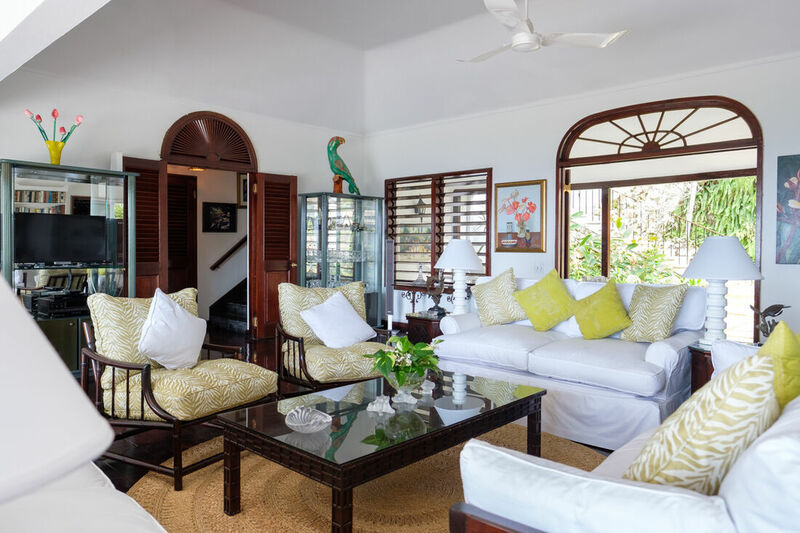 The room has private entrance from the lower patio and can be accessed only through the outside stairway, and the louvered walls lead to the tropical garden. 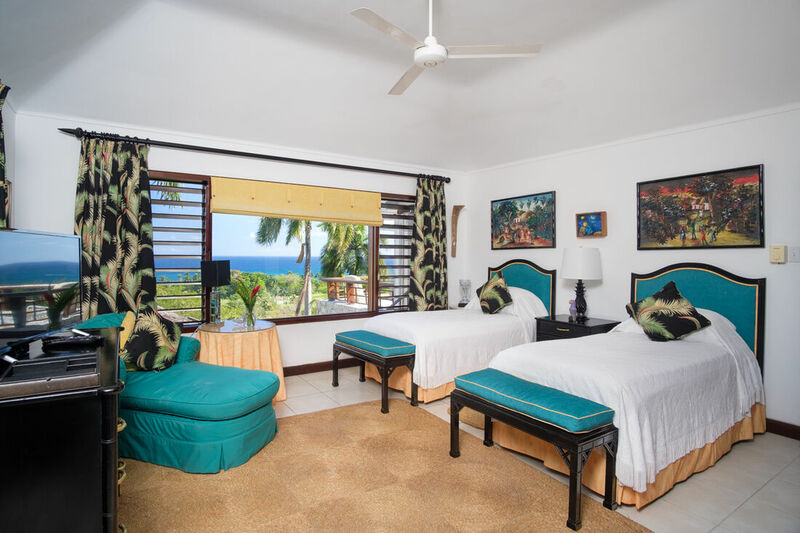 The room is furnished with a king-sized bed, cable television and DVD player. 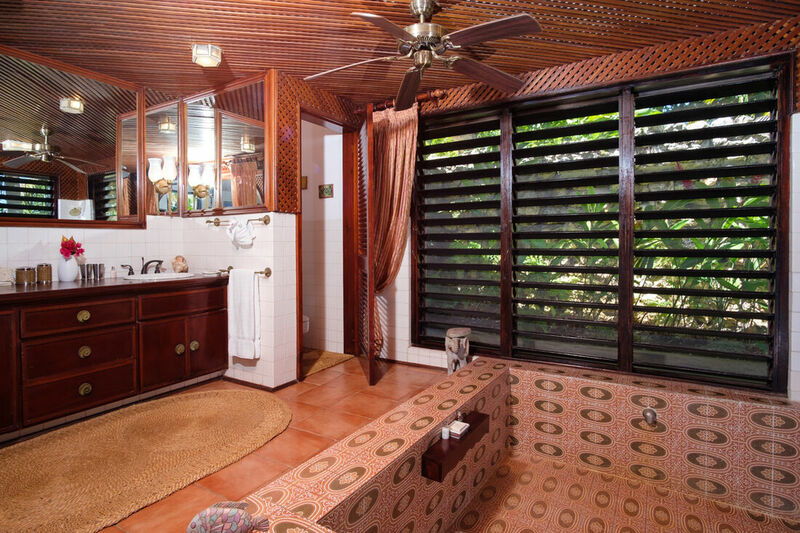 The other three bedrooms have king-size or twin beds, en-suite bathrooms, air-conditioning. 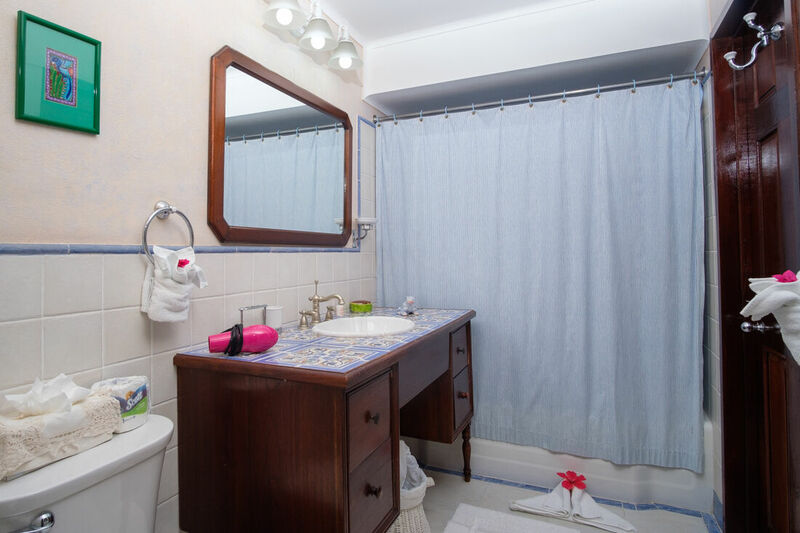 Each of the four bedrooms has an attached bathroom and wall safes. 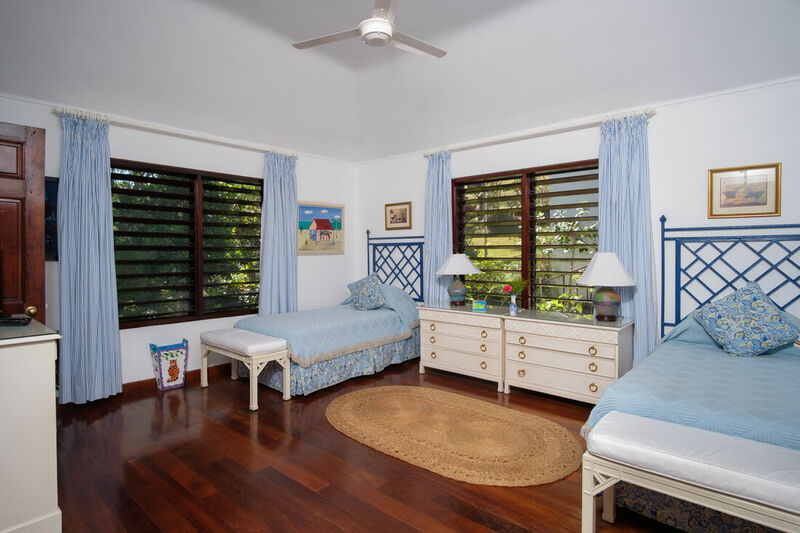 The children’s room also has cable television, while the other bedrooms can be furnished with the same on request. 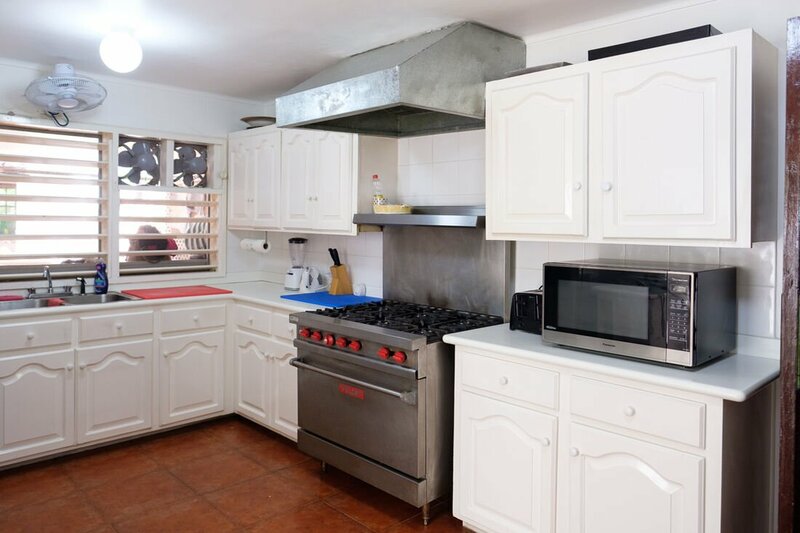 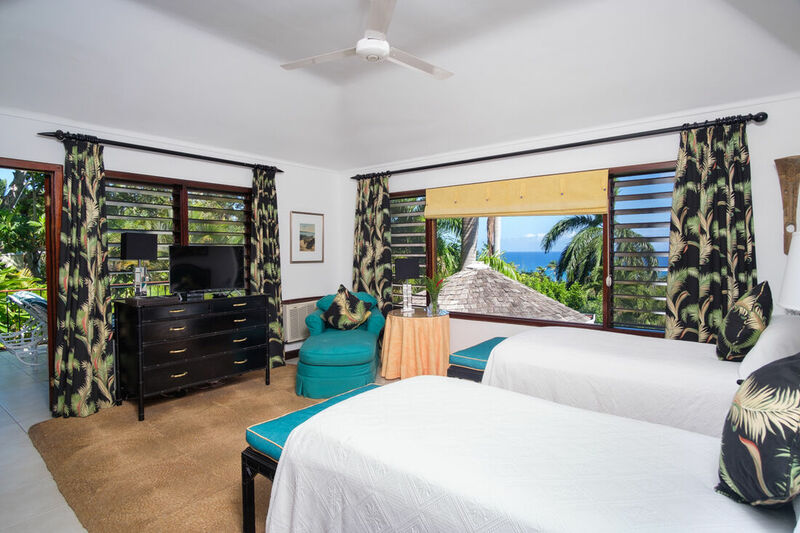 The villa comes with a full staff of five persons including the housekeeper, cook, gardener, laundress and additional helper, who provide excellent service, ensuring that the guests have a memorable vacation. 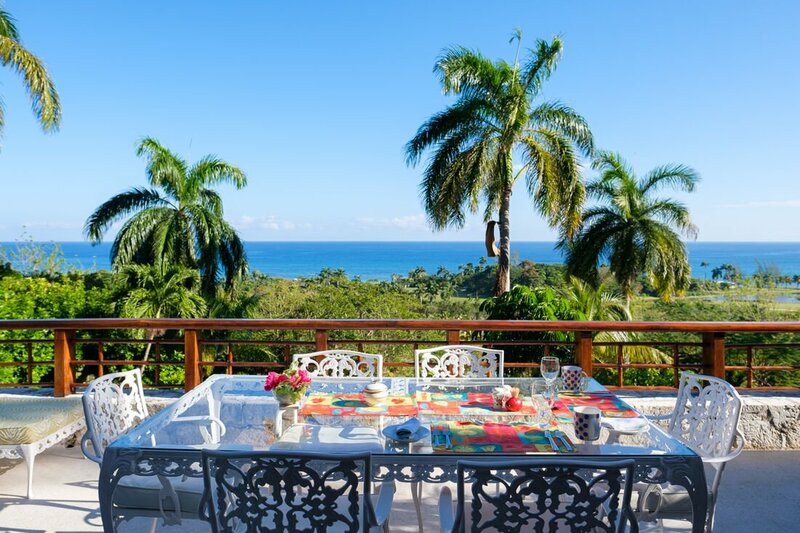 Lunch is generally served outdoors on the table placed under a large ficus tree, surrounded by the three-acre garden that is home to a diverse assortment of tropical flora. 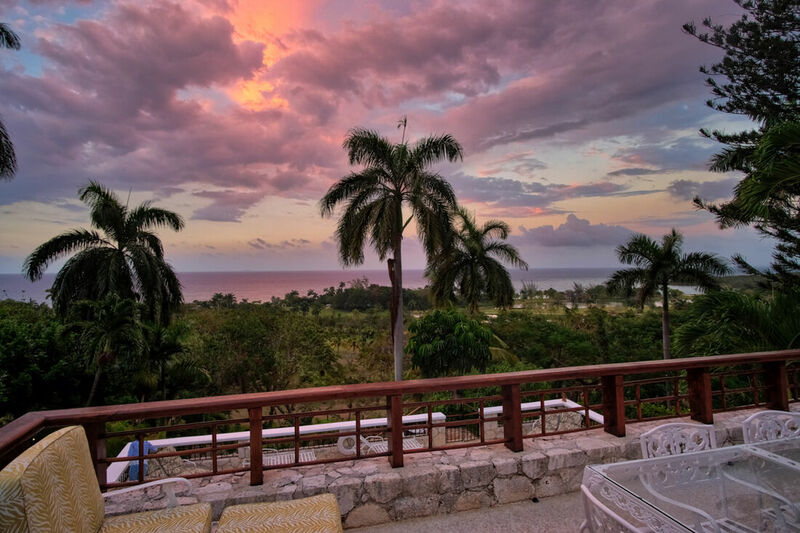 Candlelight dinners can be served on the terrace with a backdrop of lighted palm trees on the hillside and glittering lights from cruise ships and Montego Bay. 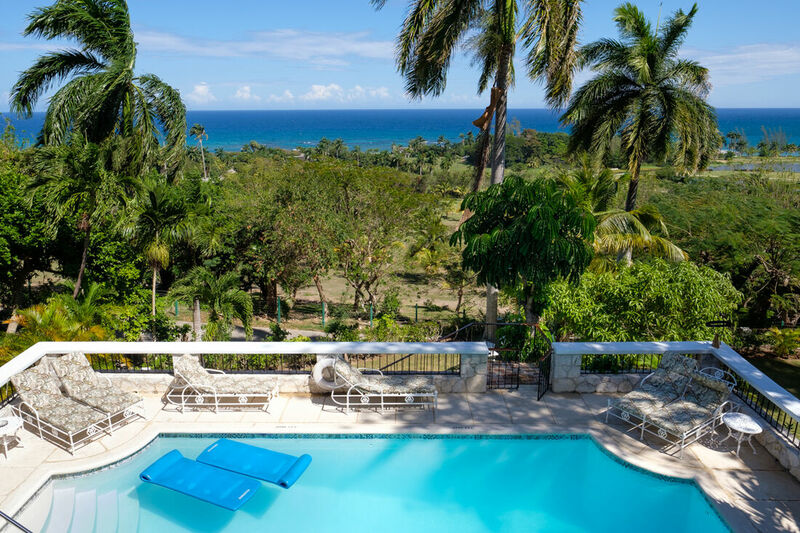 Fairwinds Villa is among the most child friendly villa rentals in Jamaica and provides supplementary facilities, such as booster seat, portable playpen, games, inflatable pool toys, kids videos and nannies on request. 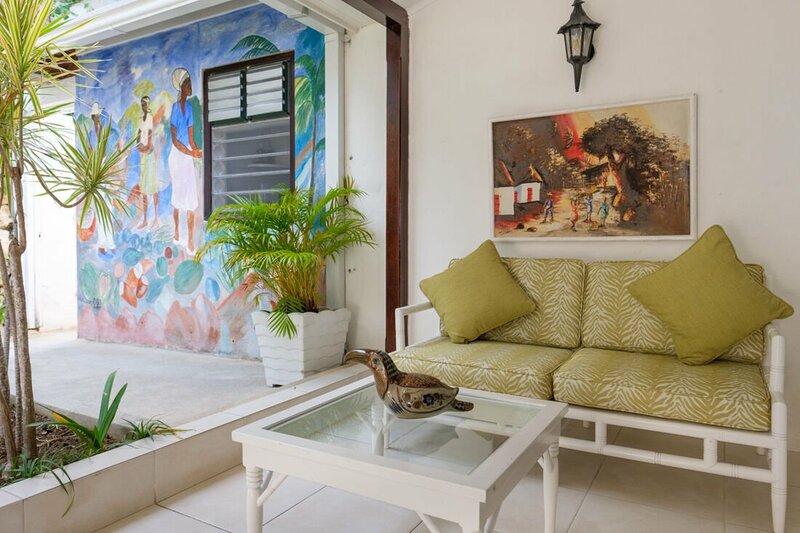 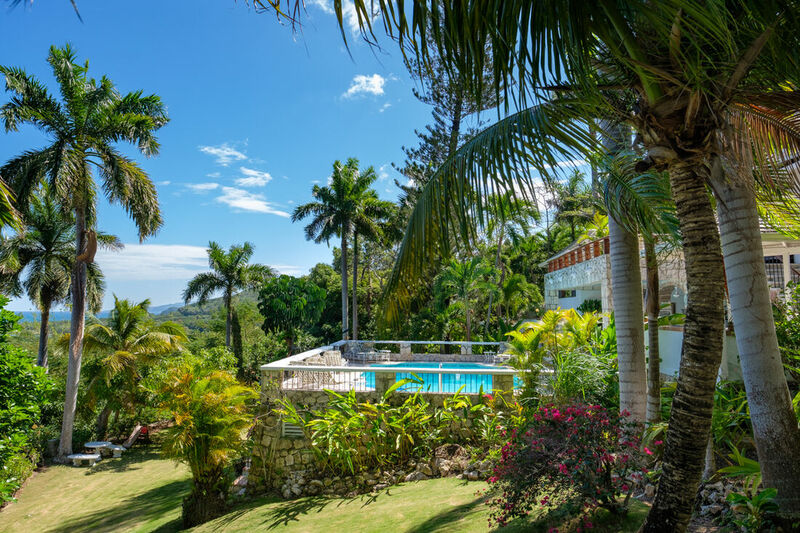 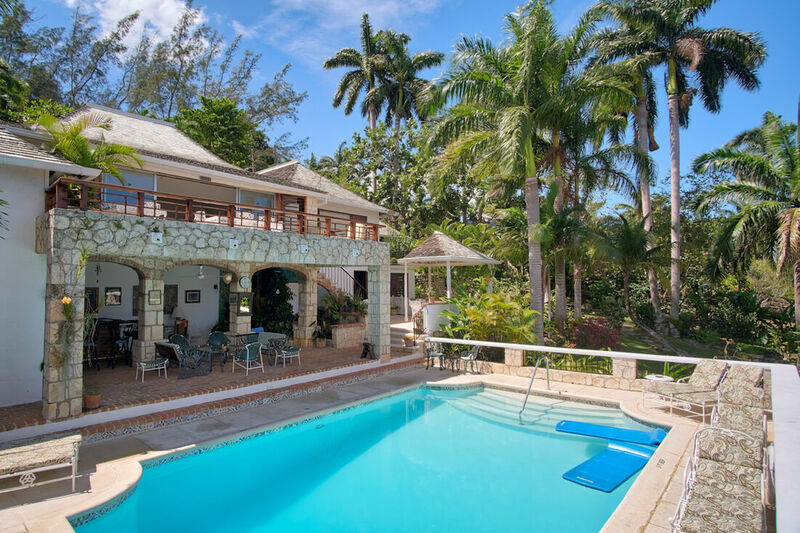 Fairwinds is one of the villas in Jamaica that enjoys complete privacy, yet is just a few minutes away from Tryall Great House, bars and restaurants, tennis and golf pro shops, beach club, shops, water sports and lively nighttime entertainment. 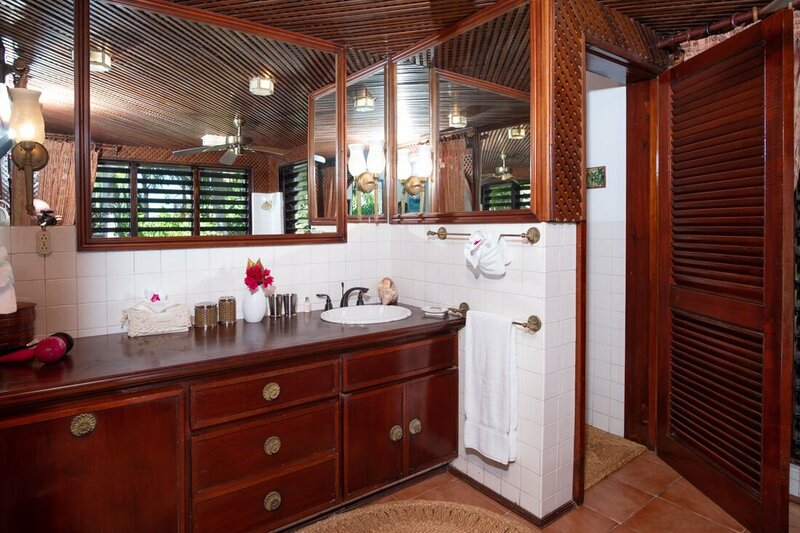 Villa guests have access to a complimentary golf cart for excursions to the 2,200 acre Tryall Club and Resort. 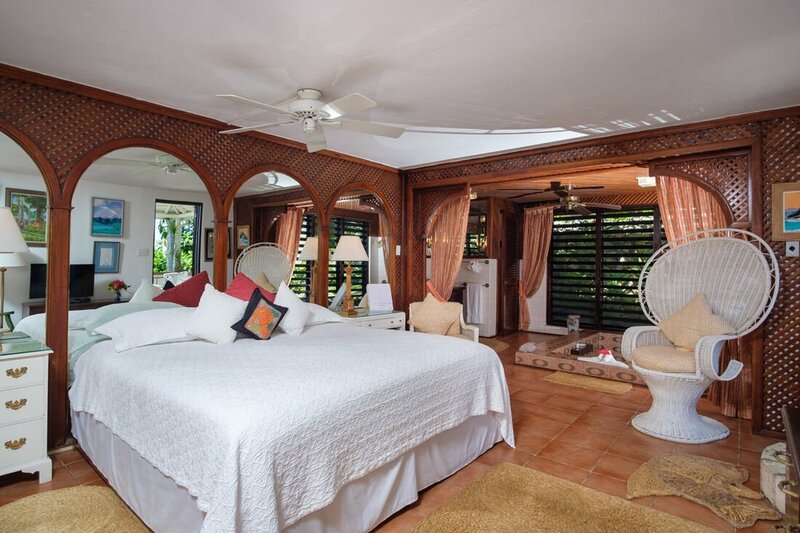 Master Bedroom: Kingsize bed; mirrored walls framed in mahogany latticework; 8-foot Mexican-tiled sunken tub with louvered walls open to tropical garden; television and VCR; private entrance from lower patio; glamorous, private and romantic. 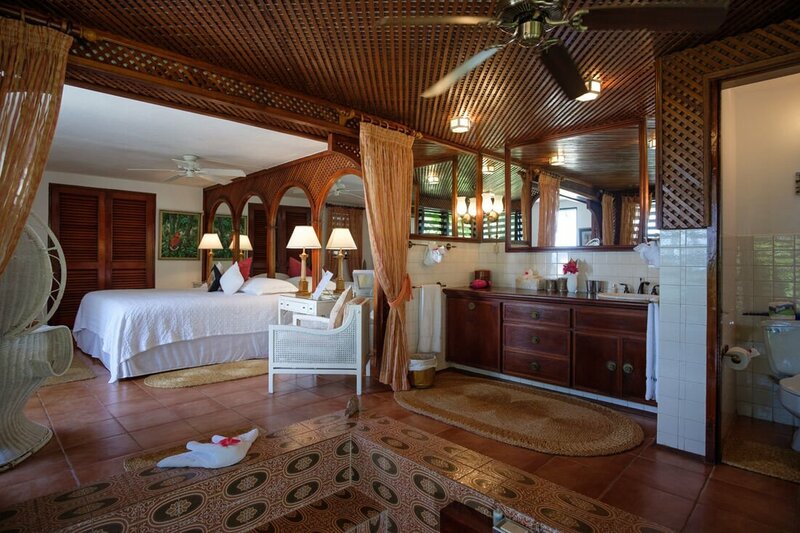 Bedroom 2: Kingsize bed; en-suite bathroom with Jacuzzi tub; sea view; private outside entrance and stairs to pool. 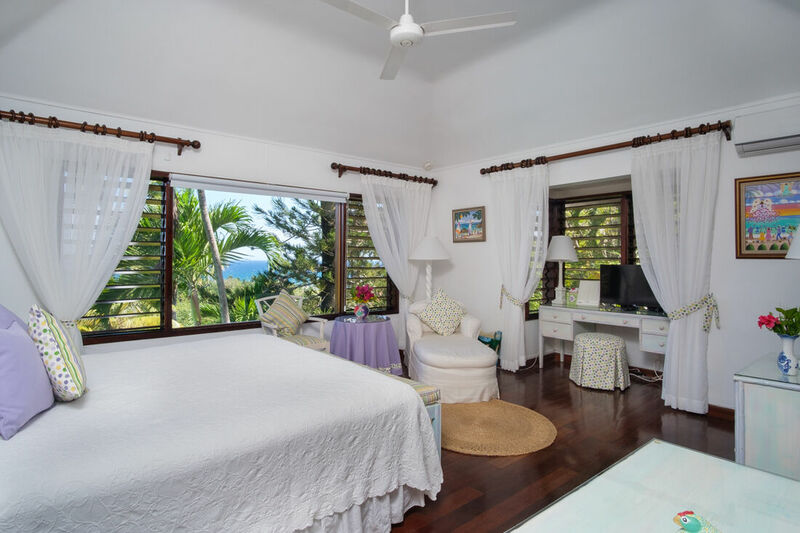 Bedroom 3: Optional kingsize or twin beds; sea view; en-suite bathroom with marble Roman tub; private terrace, stairs to pool. 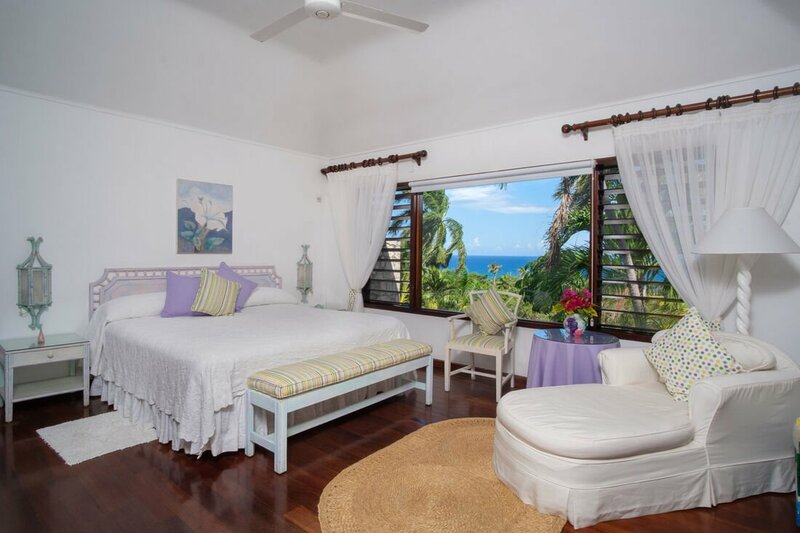 Bedroom 4: Optional kingsize or twin beds; en-suite bathroom with tub-shower combination; private outside entrance, stairs to pool. 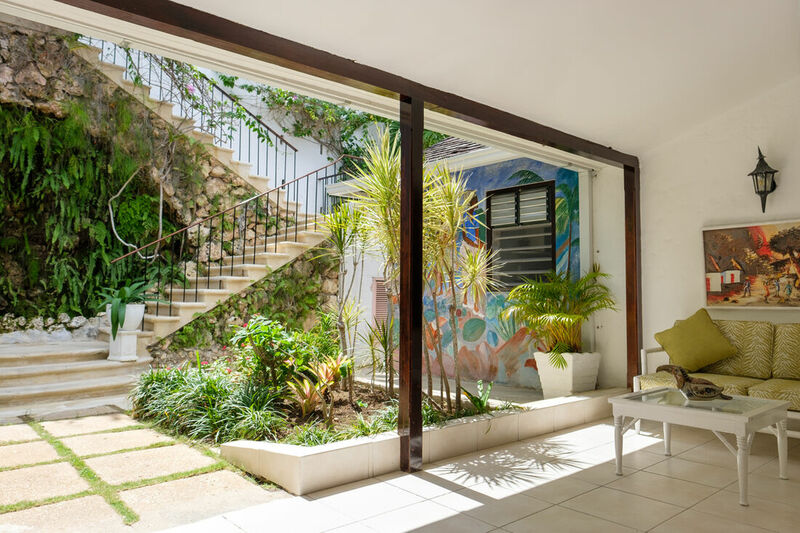 Ideal for children (door to stairs to pool can be locked) as it is on wing near Bedroom 2 ~ also fine for adults. 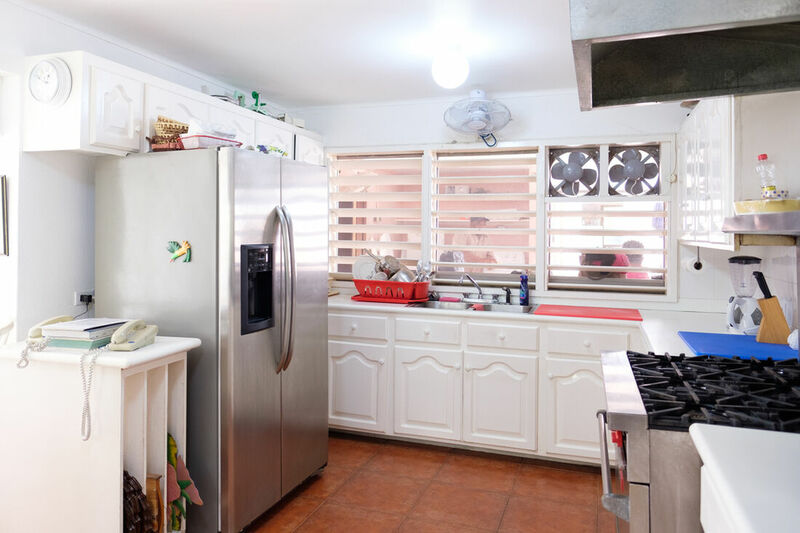 REFUNDABLE DAMAGE DEPOSIT OF $1,000 required. 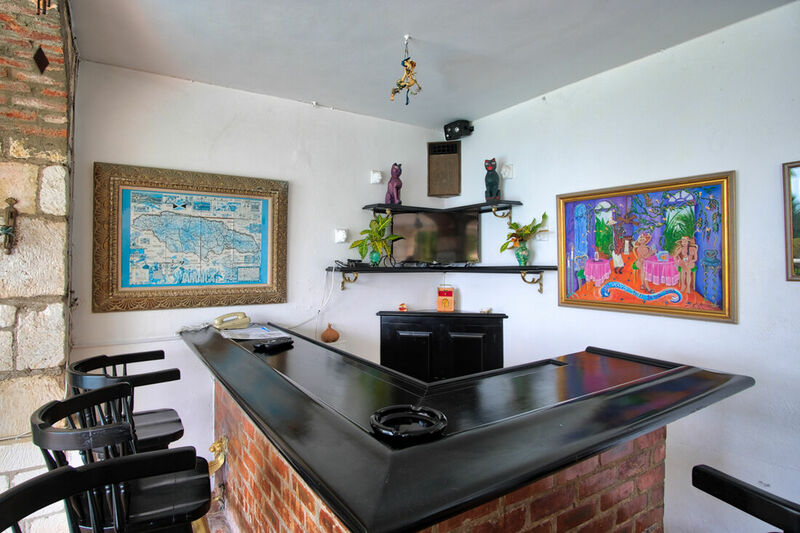 Refundable damage deposit of $500.00 is required prior to arrival.